"We have reached the tipping point..."
The concept of the Geomancer and the Eternal Warrior is a fascinating one. It explains a being tasked with preserving the planet and their protector. Incursion #1 from Valiant Comics seeks to subvert that dynamic. The issue is written by Andy Diggle and Alex Paknadel, penciled by Doug Braithwaite, colored by José Villarrubia and Diego Rodriguez and lettered by Marshall Dillon. There's always been a larger-than-life, cosmic sense to many things in the Valiant Universe--something that Diggle and Paknadel fully embrace in Incursion #1. The premise behind the issue sees the Geomancer and Eternal Warrior being confronted with a truly deadly invasion that--of course--takes place on Earth. Much of the issue is spent introducing the reader to the antagonist in Imperatix Virago and her ability to traverse the Deadside with reckless abandon. Diggle and Paknadel characterize her as something truly terrifying and so self-absorbed that she's extremely dangerous to the entire universe. What really works in the issue though is that the writing duo somewhat neutralizes the immense abilities of the Geomancer and the Eternal Warrior which should make the issue feel fresher and more interesting as it unfolds. Braithwaite handles the pencil duties on the issue and his work feels like a series of sketches. There's still plenty of emotion shown in the facial expressions of the characters despite this and Braithwaite does a great job of contrasting the anger and selfishness of the Imperatix with the innocence of the Geomancer for instance. The panels are laid out in a dizzying array of overlays that make every page feel jam-packed with chaos and things unfolding. Braithwaite's pencils are embellished by the simple colors of VIllarrubia and Rodriguez that are very tonally appropriate for the characters. The invading forces have a tinge of green while the Geomancer and Eternal Warrior are steeped in brown, earthy tones. 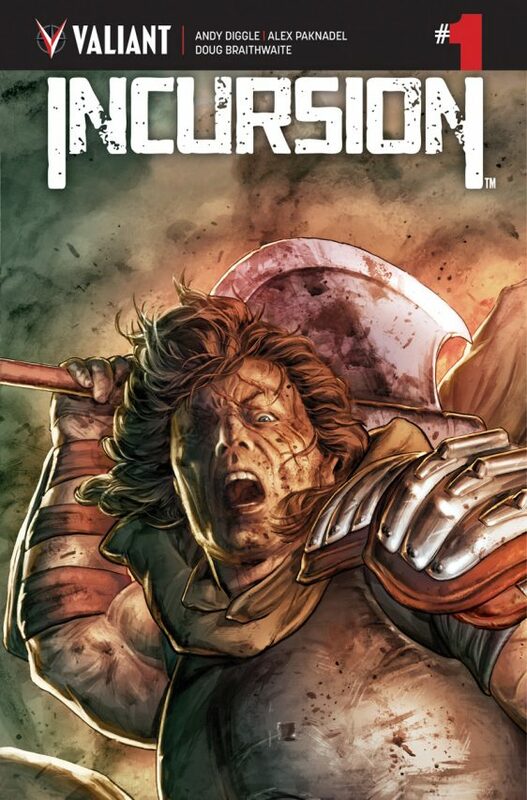 Incursion #1 is a title that lives up to its, well, title. The Eternal Warrior has generally been the most capable and dangerous entity in the room, but the issue presents what may be a true match. The script by Diggle and Paknadel is clean and informative, giving the reader plenty of backstory to know what's going on. Braithwaite's pencils are lean and slick, accentuated by the atmospheric colors of Villarrubia and Rodriguez. Incursion #1 is a great first issue to check out. Incursion #1 is available February 20.